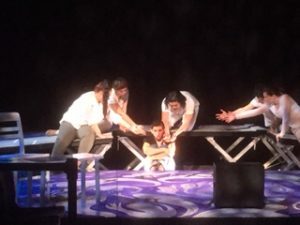 Music filled the Performing Arts Center while the audience sat on both sides of a set that resembled both a courtroom and a “dream.” Before the performance of the HCC student production of Stephen Adly Guirgis’s The Last Days of Judas Iscariot no one in the audience seemed to know what to expect. The fate of Judas Iscariot after his betrayal of Jesus, while only briefly covered in the Gospels of the New Testament, is incredibly important to Christianity. It brings into question the very nature and scope of God’s forgiveness. The HCC production of The Last Days of Judas Iscariot told the challenging story in a unique and fresh way while still exploring these themes of forgiveness, the nature of Heaven and Hell and God. The play depicts a trial held in purgatory to determine the fate of Judas Iscariot, featuring testimonies from characters such as Mother Theresa, Saint Paul and Satan. The play put together by the HCC Theater Arts Program took advantage of unconventional storytelling techniques such as hip-hop instrumentals to tell the story in a decidedly modern way a choice Theater Arts Program Coordinator, Geoff Sheehan, said he was inspired by the language of the play. The blend of the hip-hop instrumentals and dream-like set made for a surreal experience for those who experienced the play over the weekend. “Rather than create a realistic courtroom, I liked the idea of the play occurring in an ethereal world, where the dead lived, where past could be present, where souls were trying to get into Heaven and had to deal with the actions of their life,” Sheehan said. The Last Days of Judas Iscariot was performed three times: Thursday, May 5 through Sunday, May 7. The production was free and open to the public.